Program Format: In-School Performance Program Format Info: Kwanzaa is a participatory cultural theater experience. It is intended for an entire grade level to experience together. Space and/or Set Up Requirements for Program: Space large enough to seat an entire grade level. Program Learning Objective: To ensure students will have a clear understanding behind the meaning of this rich cultural tradition and that educators have the tools to develop a more enriched cultural curriculum. Teachers will be able to introduce new vocabulary, help students build self confidence, teach respect for other’s and their differences, and facilitate conversations around cultural diversity. Program Description (Grade Level Program): All about Kwanzaa is a story theatre presentation that invites the audience to not only view but experience how this African American cultural tradition is celebrated in more than 30 million homes around the world. 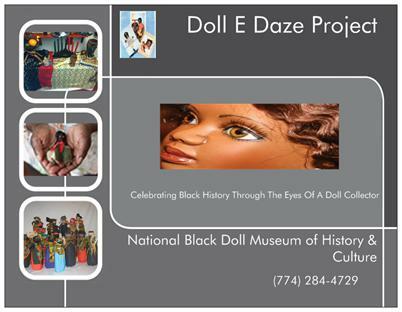 The Doll E Daze presenters dressed in authentic African attire will transform the auditorium or classroom into the Karmau (feast night event). This non religious cultural event is celebrated December 26 – January 1 . It reaffirms one’s commitment to their family, community and culture. A “feel good” celebration, it allows one to check in on the progress they have made based on the seven principles. Kwanzaa was established in 1966 by Dr Mulauna (Ron) Karenga during the height of the civil rights movement. Based on his observations he concluded that the African American community needed to celebrate and reaffirm their bond as a people and to establish a value system that strengthened their belief in their families, community and culture. Based on his research, the Nguzo Saba (seven principles) were created. During the presentation every element of the tradition will be shared with the audience, the lighting of the Mishumaa Saba(candles), reflections of our first Kwanzaa(1968), the libation, celebration, creation of the Tree of life and passing of the zawadi’s(gifts). In our story theatre presentation, audience participation is key and taught in a lively call and response pattern usually found in many African American genre of music. Students are taught new vocabulary words and symbolic elements are introduced Students will be given instruments to play, participate in dance routines, sing songs and assist with creating affirmations. The audience will discover why this rich tradition is celebrated around the world. Parent Engagement Opportunities: Caregivers are always welcome to participate in our programs as audience members and to assist with passing out supplies and encouraging student participation. Grade PK: Content Suggestion: The Individual and his/her immediate and familiar environment, including home, school and community. Use opportunities from the lives of children and significant others to explore the wider world: Strand 1.3 - Significant events and themes in world history/international studies: GLE #3: Recognize that there are other cultures with different languages, foods, art music, customs & forms of shelter. Grade PK: Theatre: Connecting: Anchor Standard 11: Relate artistic ideas and works with societal, cultural, and historical context to deepen understanding. A. With prompting and support, identify stories that are similar to one another in dramatic play or a guided drama experience (e.g., process drama, story drama, creative drama). Grade PK: Theatre: Connecting: Anchor Standard 11: Relate artistic ideas and works with societal, cultural, and historical context to deepen understanding. B. With prompting and support, tell a short story in dramatic play or a guided drama experience (e.g., process drama, story drama, creative drama). Grade K: Content Suggestion: The individual and his/her environment; include more opportunities related to the broader community. Continue to use opportunities from the lives of children and significant others to explore the wider world: Strand 1.3 - Significant events and themes in world history/international studies: GLE #6: Examine similarities and differences between one’s own culture and other cultures to which students are exposed through personal experience or media. Grade K: Theatre: Connecting: Anchor Standard 11: Relate artistic ideas and works with societal, cultural, and historical context to deepen understanding. A. With prompting and support, identify stories that are different from one another in dramatic play or a guided drama experience (e.g., process drama, story drama, creative drama). Grade K: Theatre: Connecting: Anchor Standard 11: Relate artistic ideas and works with societal, cultural, and historical context to deepen understanding. B. With prompting and support, tell a short story in dramatic play or a guided drama experience (e.g., process drama, story drama, creative drama). Grade 1: Content Suggestion: Family as a context to expand knowledge of geography, history, human interdependence, etc. Include comparisons to families in other regions, states or countries: Strand 1.3- Significant events and themes in world history/international studies: GLE #5: Analyze how one's own cultural heritage (e.g. customs, holiday celebrations, dress) has changed over time. Grade 1: Theatre: Connecting: Anchor Standard 11: Relate artistic ideas and works with societal, cultural, and historical context to deepen understanding. A. Identify similarities and differences in stories from one’s own community in a guided drama experience (e.g., process drama, story drama, creative drama). Grade 1: Theatre: Connecting: Anchor Standard 11: Relate artistic ideas and works with societal, cultural, and historical context to deepen understanding. B. Collaborate on the creation of a short scene based on a fictional literary source in a guided drama experience (e.g., process drama, story drama, creative drama). Grade 2: Content Suggestion: One’s town to expand knowledge of geography, history, human interdependence, etc. Include comparisons with another town or city in Connecticut: Strand 1.3 - Significant events and themes in world history/international studies: GLE #6: Investigate one’s own family heritage making comparisons to classmates and community members. Grade 2: Theatre: Connecting: Anchor Standard 11: Relate artistic ideas and works with societal, cultural, and historical context to deepen understanding. A. Identify similarities and differences in stories from multiple cultures in a guided drama experience (e.g., process drama, story drama, creative drama). Grade 2: Theatre: Connecting: Anchor Standard 11: Relate artistic ideas and works with societal, cultural, and historical context to deepen understanding. B. Collaborate on the creation of a short scene based on a non-fiction literary source in a guided drama experience (e.g., process drama, story drama, creative drama). Grade 3: Content Suggestion: One’s town as a context to expand knowledge of geography, history, human interdependence, etc., incorporating international comparisons. This may include comparing the history and geography of the local community with at least one other town in the United States and at least two towns or regions in other parts of the world: Strand 1.3 - Significant events and themes in world history/ international studies: GLE #5: Investigate one's own family heritage, making comparisons to classmates & community members. Grade 3: Theatre: Responding: Anchor Standard 7: Perceive and analyze artistic work. A. Understand why artistic choices are made in a drama/theatre work. Grade 3: Theatre: Responding: Anchor Standard 8: Interpret intent and meaning in artistic work. A. Consider multiple personal experiences when participating in or observing a drama/theatre work. Grade 3: Theatre: Responding: Anchor Standard 8: Interpret intent and meaning in artistic work. C. Examine how connections are made between oneself and a character’s emotions in drama/theatre work. Grade 4: Content Suggestions: The study of significant events, people, and geographic features of Connecticut in the past and today, with comparisons to other U.S. states and one or more states, provinces, and/or areas in other countries: Strand 1.13 - The characteristics of and interactions among culture, social systems and institutions: GLE #23: Compare and contrast different ethnic groups’ contributions to the community and state (e.g. literature, the arts, politics, festivals, cuisine). Grade 4: Theatre: Responding: Anchor Standard 7: Perceive and analyze artistic work. A. Identify artistic choices made in a drama/theatre work through participation and observation. Grade 4: Theatre: Responding: Anchor Standard 8: Interpret intent and meaning in artistic work. A. Compare and contrast multiple personal experiences when participating in or observing a drama/theatre work. Grade 4: Theatre: Responding: Anchor Standard 8: Interpret intent and meaning in artistic work. B. Compare and contrast the qualities of characters in a drama/theatre work through physical characteristics and prop or costume design choices that reflect cultural perspectives. Grade 5: Content Suggestion: The study of events, documents, and people addressing the founding of the United States as a nation, with connections to Connecticut and local history, emphasizing how government works today, with the use of primary source materials: Strand 1.13 - The characteristics and interactions among cultural social systems and institutions: GLE #23: Compare & contrast different ethnic groups’ contributions to the community and state. (e.g) literature, arts, political festivals. Grade 5: Theatre: Responding: Anchor Standard 7: Perceive and analyze artistic work. A. Explain personal reactions to artistic choices made in a drama/theatre work through participation and observation. Grade 5: Theatre: Responding: Anchor Standard 8: Interpret intent and meaning in artistic work. B. Explain responses to characters based on cultural perspectives when participating in or observing drama/theatre work. Grade 5: Theatre: Responding: Anchor Standard 8: Interpret intent and meaning in artistic work. a. Justify responses based on personal experiences when participating in or observing a drama/theatre work. Grade 6: Content Suggestion: World Regional Studies of up to four countries or regions from different continents considering the geography, two selected periods of history, and contemporary cultures of these countries: Strand 1.13 - The characteristics of and interactions among culture, social systems and institutions: GLE #26: Describe how social, cultural and economic circumstances influence individual lives. Grade 6: Content Suggestion: World Regional Studies of up to four countries or regions from different continents considering the geography, two selected periods of history, and contemporary cultures of these countries: Strand 1.13 - The characteristics of and interactions among culture, social systems and institutions: GLE #24: Compare similarities and differences of cultural groups in different world regions. Grade 6: Theatre: Responding: Anchor Standard 7: Perceive and analyze artistic work. A. Describe and record personal reactions to artistic choices in a drama/theatre work. Grade 6: Theatre: Responding: Anchor Standard 8: Interpret intent and meaning in artistic work. B. Identify cultural perspectives that may influence the evaluation of a drama/theatre work. Grade 6: Theatre: Responding: Anchor Standard 8: Interpret intent and meaning in artistic work. C. Identify personal aesthetics, preferences, and beliefs through participation in or observation of drama/ theatre work. Grade 7: Content Suggestion: World Regional Studies of three or four countries or regions from different continents considering the geography, two selected periods of history, and contemporary cultures of these countries: Strand 1.3 - Significant events and themes in world history/international studies: GLE #6: Analyze how specific individuals and their ideas and beliefs influenced world history. Grade 7: Theatre: Responding: Anchor Standard 7: Perceive and analyze artistic work. A. Compare recorded personal and peer reactions to artistic choices in a drama/ theatre work. Grade 7: Theatre: Responding: Anchor Standard 8: Interpret intent and meaning in artistic work. B. Describe how cultural perspectives can influence the evaluation of drama/theatre work. Grade 7: Theatre: Responding: Anchor Standard 8: Interpret intent and meaning in artistic work. C. Interpret how the use of personal aesthetics, preferences, and beliefs can be used to discuss drama/theatre work. Grade 8: Content Suggestion: The study of the principles of the U.S. Constitution, with emphasis on events, arguments, and movements of the 19th century and their impact today, connections to local history, and extensive use of primary source materials: Strand 1.13 - The characteristics of and interactions among culture, social systems and institutions: GLE #27: Compare similarities and differences of ethnic/cultural groups in the United States (e.g. beliefs values, traditions and their impact on American social systems. Grade 8: Theatre: Responding: Anchor Standard 7: Perceive and analyze artistic work. A. Apply criteria to the evaluation of artistic choices in a drama/theatre work. Grade 8: Theatre: Responding: Anchor Standard 8: Interpret intent and meaning in artistic work. B. Describe how cultural perspectives can influence the evaluation of drama/theatre work. Grade 8: Theatre: Responding: Anchor Standard 8: Interpret intent and meaning in artistic work. C. Interpret how the use of personal aesthetics, preferences, and beliefs can be used to discuss drama/theatre work.